Objective: The primary safety objective is Acute Kidney Injury (AKI), defined as an increase in serum creatinine of at least 0.5 mg/dL or a 50% increase in serum creatinine from baseline at any time during antibiotic therapy. The objective of this study is to assess safety of Extended Infusion Piperacillin-tazobactam (EIPT) and vancomycin therapy versus Standard Infusion Piperacillin-tazobactam (SIPT) and vancomycin in general medicine patients, and to evaluate if one treatment modality predisposes patients to a greater risk of nephrotoxicity. Setting: Data from a large academic medical center was analyzed over a 3 month period pre and post implementation of extended infusion piperacillin-tazobactam protocol. 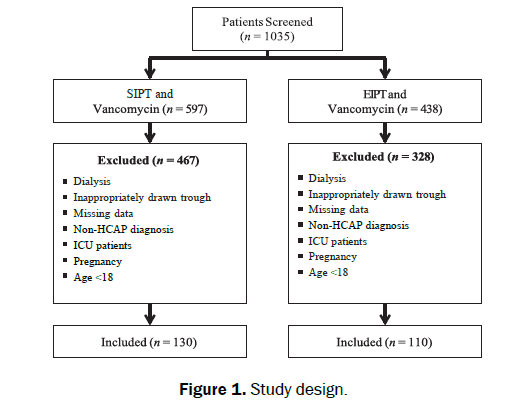 Design: A retrospective analysis was conducted comparing patients admitted to the hospital with a diagnosis of Healthcare Associated Pneumonia (HCAP) who received EIPT plus vancomycin versus SIPT plus vancomycin. Patients: Adult hospitalized patients on combination therapy with two or more Serum Creatinine (SCr) measurements were included. Patients were excluded if they are less than 18 years of age, are pregnant, or if they are on any form of dialysis including continuous renal replacement therapy. Conclusion: A total of 241 patients were evaluated for AKI. Safety outcomes were compared between the two treatment groups and contributing factors for developing AKI were also assessed. The incidence of AKI was significantly higher in the SIPT and vancomycin group (20.0%) compared with the EIPT and vancomycin group (10.0%) in the analysis (p=0.033). There were no significant differences in the baseline characteristics between the groups with the exception of a higher percentage of patients with a diagnosis of hypertension in the EIPT and vancomycin group (p<0.05). According to United States data, the reported prevalence of hospital-acquired AKI is estimated to be up to 7.2% . AKI has a poor prognosis with mortality ranging from 10% to 80% [2,3]. Vancomycin and piperacillin-tazobactam both present concern for AKI. Safety data regarding extended infusion combination therapy has not been fully evaluated. Nephrotoxicity associated with vancomycin administration has been a topic of debate for decades. Vancomycin is a glycopeptide antibiotic excreted by the kidneys and has been used extensively, especially for Methicillin-resistant Staphylococcus aureus (MRSA) and for many strains of pathogenic Staphylococcus epidermis [4,5]. However, the nephrotoxic potential of vancomycin is not fully understood. Penicillins have the potential to cause AKI through acute interstitial nephrirtis [6,7]. Piperacillin-tazobactam is a beta-lactam/beta-lactamase inhibitor that is also eliminated via the kidneys. Piperacillin-tazobactam has a broad spectrum of activity that includes: gram-positive organisms, gram-negative organisms including Pseudomonas aeruginosa, and anaerobes . Limited data is available comparing the nephrotoxic potential of vancomycin when combined with certain beta-lactam antibiotics such as piperacillin-tazobactam. Safety data regarding the combination therapy have also been limited. Hellwig et al. conducted a retrospective evaluation of 735 adult patients . Patients on combination therapy of piperacillin-tazobactam plus vancomycin were compared to patients on monotherapy of either agent. The authors defined AKI as an increase in SCr of ≥ 0.5 mg/dL or a 50% increase from baseline and the results of this study showed that the combination therapy of piperacillin-tazobactam and vancomycin nearly doubled the incidence of AKI in general medicine patients (18.6%) and in intensive care patients (21.2%) compared to vancomycin monotherapy (4.9% and 6.0%) and piperacillin-tazobactam monotherapy (11.2% and 12.2%) respectively . It is important to note that AKI is defined as an abrupt deterioration in kidney function resulting from a functional or structural alteration to the kidney. According to the Kidney Disease Outcomes Quality Initiative (KDOQI) Clinical Practice Guidelines, AKI is defined as an absolute increase in serum creatinine (SCr) of ≥ 0.3mg/dL within 48 hr, or ≥ 50% increase in SCr within seven days, or a reduction in urine output—documented oliguria of <0.5 mL/kg/hr for > 6 hr . Complications of AKI may lead to: increased hospital stay, increased cost, and increased mortality. Piperacillin-tazobactam and vancomycin are typically recommended as empirical combination therapy in patients who are at a greater risk of infections caused by drug-resistant pathogens. According to the American Thoracic Society Healthcare Associated Pneumonia (HCAP) Guidelines, an anti-pseudomonal beta-lactam plus vancomycin plus or minus an anti-pseudomonal fluoroquinolone or aminoglycoside are recommended as empiric treatment . Based on observational data and anecdotal experience from Infectious Disease physicians at our institution, concern arose about the possible increase incidence of AKI in patients on combination therapy. The purpose of this study is to assess safety of Extended Infusion Piperacillin-tazobactam (EIPT) and vancomycin therapy versus Standard Infusion Piperacillin-tazobactam (SIPT) and vancomycin in general medicine patients with a diagnosis of HCAP, and to evaluate if one treatment modality predisposes patients to a greater risk of nephrotoxicity. Advocate Christ Medical Center (ACMC) is a private, non-profit, 749 bed community teaching institution, Level 1 trauma center, providing emergency care for more than 100,000 patient visits annually and is recognized by the American Nurses Credentialing Center as a Magnet Medical Center since 2005. This study was approved by the institutional review board with exempt status. This was a retrospective chart review of patients on combination therapy of SIPT plus vancomycin who were admitted to ACMC between January through March of 2012 and compared to patients on EIPT plus vancomycin who were admitted between January through March of 2013. In October of 2012, ACMC transitioned from the SIPT protocol and the EIPT protocol. Per institutional protocol, most adult patients received the first dose of piperacillin-tazobactam over 30 min in the emergency department with all subsequent doses administered over 4 hr in the EIPT plus vancomycin group. Additionally, all vancomycin dosing was typically managed and monitored by clinical pharmacists and there was no change in the vancomycin pharmacokinetics dosing protocol between the groups. AKI in this study was defined as an increase in SCr of ≥ 0.5 mg/dL or a 50% increase from baseline. Patients were included in the study if they were 18 years old or older, had a diagnosis of HCAP and were admitted to general medicine floors (non-ICU), had a baseline Serum creatinine (Scr), which was defined as the lowest Scr prior to initiating antibiotics, a Scr level drawn post antibiotic initiation, at least one vancomycin trough level, and had received atleast one dose of piperacillintazobactam and vancomycin during admission. Patients were excluded if they were currently receiving dialysis or pregnant. The primary end point was to assess the incidence of AKI in patients on EIPT and vancomycin therapy versus SIPT and vancomycin in general medicine patients with a diagnosis of HCAP. Medical and laboratory data were extracted from electronic medical records. Data collected included age, race, gender, weight, height, comorbidities (i.e., hypertension, diabetes, Cardiovascular Disease (CVD), Chronic Kidney Disease (CKD), Cancer, Heart Failure (HF), Chronic Obsrtuctive Pulmondary Disease (COPD), baseline Scr, highest Scr post antibiotic initiation, and concomitant nephrotoxic agents (i.e., aminoglycoside antibiotics, antivirals, Non-steroidal Anti-inflammatory Drugs (NSAIDs), Angiotensin-Converting Enzyme Inhibitors (ACE-Is) or Angiotensin II Receptor Blockers (ARBs), diuretics, intravenous [IV] contrast, or spironolactone). Vancomycin daily dose and the highest vancomycin trough prior to AKI diagnosis were also collected. Vancomycin troughs that were not drawn appropriately were excluded from the analysis. Comparisons for demographics and baseline characteristics between the two groups were assessed using the Pearson X test or Fisher exact tests for categorical data including the incidence of AKI. Mann Whitney U test was utilized for non-parametric data. A p value of 0.05 or less was considered significant. All statistical analyses were run using SPSS version 21. In total, 240 patients were included in the analysis. Figure 1 lists the reasons for exclusion. Overall, patients were fairly similar between the groups. There were no significant differences in the baseline characteristics with the exception of hypertension which was more prevalent in the EIPT and vancomycin group (p<0.05). Table 1 summarizes the other baseline demographic characteristics. The initial vancomycin trough levels were similar between groups with a mean of 11.8 mcg/L in the SIPT and vancomycin group and 12.6 mcg/L in the EIPT and vancomycin group with a p=0.10 respectively. No statistically significant differences were found between each concomitant nephrotoxic agent (e.g., ACE-I, ARB, IV contrast, antivirals, diuretics, or aminoglycosides). The primary outcome of AKI resulted in 26 of the 130 patients (20.0%) in the SIPT and vancomycin group, compared to 10 of the 110 patients (10.0%) in the EIPT and vancomycin group (p=0.033). However, the average Scr increase was not statistically significant between the groups (SIPT=1.3 ± 1.02 mg/dL, EIPT=1.02 ± 0.61 mg/dL) p= 0.52 respectively. It is important to note that the highest magnitude in Scr was found in the SIPT group at 4.69 mg/dL compared to the EIPT group of which the highest Scr level was merely 2.72 mg/dL. Furthermore, the average total daily vancomycin dose was comparable between the groups (SIPT group = 1610 mg, EIPT group 1590 mg) p=0.85 respectively. Table 1. Data are number (%) unless otherwise indicated. Scr: Serum creatinine; CVD: Cardiovascular Disease; CKD: Chronic Kidney Disease; COPD: Chronic Obstructive Pulmonary Disease; NSAID: Non-steroidal Anti-inflammatory Drug; ACE: Angiotensin-Converting Enzyme; ARB: Angiotensin II Receptor Blocker. In an attempt to account for potential confounding by indication, we limited the study to a single diagnosis of HCAP. This is where the larger majority of patients are treated with piperacillin-tazobactam and vancomycin combination therapy. The use of SIPT and vancomycin in combination was associated with a significantly higher incidence of AKI compared with the EIPT and vancomycin combination regimen. Our study did not find any statistically significant differences in vancomycin doses or troughs. Further, there were no significant differences of receipt of other nephrotoxic agents between treatment groups. The exact mechanism of action underlying the association between AKI and combination piperacillin-tazobactam and vancomycin is unknown. This study had several limitations. The data were retrospectively extracted from multiple collectors in a non-blinded manner from the electronic health record from a single site, and accurate documentation was assumed. Data were not collected for all risk factors that predispose patients to drug-induced AKI, such as patient’ s volume status, or duration of antibiotic therapy. The study was also limited do the small sample size. Moreover, variations in the multiple generic products may have influenced the incidence of AKI. It is important note that time to onset and resolution of AKI was not assessed. Although a statistical difference in baseline characteristic of hypertension with more patients in the EIPT and vancomycin group was observed, mean baseline Scr was identical in both groups. A multicenter prospective study should be conducted to confirm these results. In conclusion, in contrast to physician concerns prior to this study, there was actually a much lower incidence of AKI in general medicine floor patients receiving EIPT plus vancomycin compared to SIPT plus vancomycin for the treatment of HCAP. Average vancomycindoses and troughs were comparable between the groups and nephrotoxic agents were not confounding variables. The present study suggests an increase in the risk of developing AKI with SIPT and vancomycin combination therapy when compared with EIPT and vancomycin combination therapy. The mechanism by which combination piperacillin- tazobactam and vancomycin may increase the development of AKI remains to be fully understood. Larger and more robust studies are warranted before definitive recommendations can be made about the use piperacillin-tazobactam and vancomycin combination therapy. Liaño F et al. The spectrum of acute renal failure in the intensive care unit compared with that seen in other settings. The Madrid Acute Renal Failure Study Group. Kidney Int. 1998;53:S16-24. Cosentino F et al. Risk factors influencing survival in ICU acute renal failure. Nephrol Dial Transplant. 1994;9:179-82. Rybak M et al. Therapeutic monitoring of vancomycin in adult patients: a consensus review of the American Society of Health-System Pharmacists, the Infectious Diseases Society of America, and the Society of Infectious Diseases Pharmacists. Am J Health Syst Pharm. 2009;1:82–98. Vancomycin. In: Lexi-drugs online [database on the Internet]. Hudson (OH): Lexicomp, Inc.; 2013 [updated 6 Jan 2011; cited 10 Mar 2014]. Available from: http://online.lexi.com. Baldwin D et al. Renal failure and interstitial nephritis due to penicillin and methicillin. N Engl J Med. 1968;23:1245-52. Liu P et al. Acute renal failure induced by semi- synthetic penicillins. Can Fam Physician. 1981;27:507-12. Piperacillin-Tazobactam. In: Lexi-drugs online [database on the Internet]. Hudson (OH): Lexicomp, Inc.; 2013 [updated 6 Jan 2011; cited 10 Mar 2014]. Available from: http://online.lexi.com. Hellwig T et al. Retrospective evaluation of the incidence of vancomycin and/or piperacillin-tazobactam induced acute renal failure. Crit Care Med. 2011;12:79. Rocco MV and Berns JS. KDOQI clinical practice guideline for diabetes and CKD: 2012 Update. American Journal of Kidney Diseases. 2012;60:850-886. American Thoracic Society (2005). Guidelines for the management of adults with hospital-acquired, ventilator-associated, and healthcare- associated pneumonia. Am J Respir Crit Care Med. 171, 388-416.